Walton County is a county located in the state of Florida. As of the 2010 census, the population was 55,043. Its county seat is DeFuniak Springs. The county is home to the highest natural point in Florida: Britton Hill, at 345 feet (105 m). 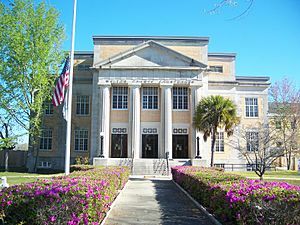 Walton County was created in 1824. It was named for the son of George Walton the Signer, Colonel George Walton, Jr (born 15 Aug 1786 in Augusta, Richmond Co, Georgia; died 20 Mar 1859 in Petersburg, Virginia) who was Secretary of the Florida territory from 1821 to 1826. The county was settled in the early 18th Century by Scots who migrated from the Carolinas. The original settlements were in the Euchee (Yuchi) Valley near the landing on the Choctawhatchee River maintained by an Indian named Sam Story. They established one of the first Presbyterian churches in Northwest Florida which is still a functioning parish with an historical cemetery. According to the U.S. Census Bureau, the county has a total area of 1,240 square miles (3,200 km2), of which 1,038 square miles (2,690 km2) is land and 202 square miles (520 km2) (16.3%) is water. The County is one of the largest in size in the state, stretching from the Alabama state line to the Emerald Coast. The summit of Britton Hill, Florida's highest point at 345 feet, is located in northern Walton County. Walton County, Florida Facts for Kids. Kiddle Encyclopedia.